Time for a progress update on my 32 Litre "Tree Scape" Tank! Still no Co2 injection, no Excel, no fertilizers added... and the Hemianthus Callitrichoides (HC) carpet is still growing steadily. Although i actually do have Co2 injection equipment, chemicals and fertilizers available to use, i'm now very keen to see how this tank progresses without the help of those items. It will be an on-going experiment in using a low-tech/low-maintenance natural approach to plant growth. I have also added in a group of Danio Margaritatus (aka Celestial Pearl Danio) and Danio Erythromicron (aka Emerald Dwarf Danio) as the new resident fauna, both are very similar in size, shape, behavior and habits, often banding together in small "hunting" packs and patrolling the mid-bottom levels of the tank. 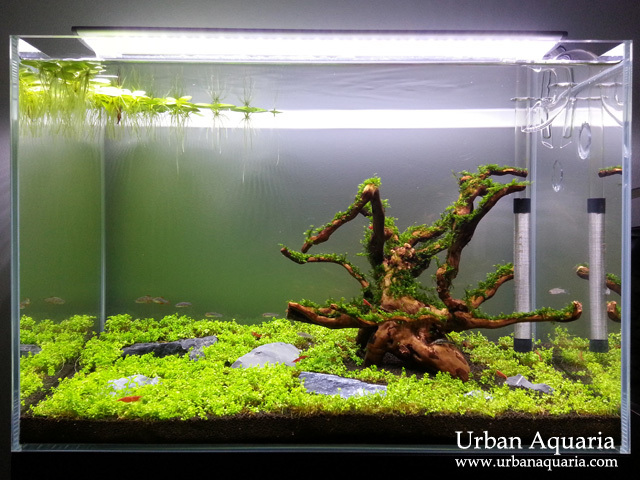 Notice that the HC carpet on the left side of the tank looks much brighter and more lush than those on the right side? My guess is that the bogwood piece is perhaps overshadowing that area, so the growth is slower there. It could also be due to the water current being better at the left side too (based on the flow direction of the lily pipe output). This probably resembles the effect of large trees in nature, where the areas under them usually have less plant growth, due to the tree canopy blocking out sunlight and drawing in more nutrients. The biggest surprise for me is the growth of the Fissidens Fontanus on the bogwood tree structure, there is definitely a very noticeable difference in the span of 4 weeks... the fissidens cling to the wood very securely on their own after just a few weeks and alot of fresh new growth can be seen sprouting out from the sides of the trunk and branches. I was expecting the fissidens to grow very slowly, but it turns out that they are actually growing much faster than i expected. Hi UA, sorry to dig out ur old post. Can I ask where can I find Danio Erythromicron (aka Emerald Dwarf Danio) in Singapore? Those fishes are usually available occasionally at most LFS... at the moment, you could try checking at LFS like Aquatic Avenue or Green Chapter, there is a chance they may still have some stock of those fishes. Do you think that CPD (or danio erythromicron) will mix well with Chili rasboras in a 5 gallon relatively-planted tank? Will the boraras do well as dither fish for the CPD or will the CPD still be hiding all the time? Thinking of adding a little more solid colours into my tank of cherries and boraras.. Didn't get such great boraras from C328; even though they are colouring up nicely from when i first got them a few weeks ago, they're still like 50% translucent and not as red as yours from your other tank. In any case, would appreciate your advice regarding adding some CPDs/D. Erythromicron. As it stands now I have 6-7 boraras and a bunch of cherries in the 5 gallon tank, with a 500L/h UP Slim filter with necessary media. Yes, CPDs can live alongside Chili Rasboras without issues. The boraras fishes could help to reduce the shyness of CPDs, just have to try and see. Densely planted tank environments are good for CPDs too, they feel more comfortable and tend to appear in the open more often. I have since changed my tank to a 45cm low-ish profile slim tank (45x20x25). After adding 4 CPDs and 4 Erythromicrons into the tank which already has 10 boraras, the boraras are now the shy and timid ones, always hiding behind plants/wood at the back of the tank! I hardly see them anymore, whereas the 2 danio/microrasbora species are always zipping around all over. Sometimes different groups of fishes also claim specific territories in the tank too, so you will tend to notice distinct groups congregating in their own areas. I've been toying somewhat with the idea of getting a main feature fish for this tank, like a female betta or a Pygmy Gourami; do you think it's a good idea? I know they might attack some shrimps..but would it be a high stress situation all around for the fishes involved (and is it already grossly overstocked)? Would appreciate your input on this! From my experience keeping bettas in community tanks, they tend to have individual personalities. Some may constantly chase and bite other fishes and eat the shrimps, while some may be relatively peaceful... you'll just have to try and see. Just be ready to quickly remove it from the tank if you happen to get one that isn't the friendly sort. Pygmy gourami (aka sparkling gourami) are generally more peaceful towards other fishes, but they are expert shrimp hunters. I've kept a group of sparkling gouramis before, and they were able to gang up and kill much larger sized yamato shrimps. I guess if you don't mind the possibility of the shrimps being attacked and eaten, then those fishes could be okay to keep in a community tank. I guess your current bio-load is already more or less sufficient for the tank volume. 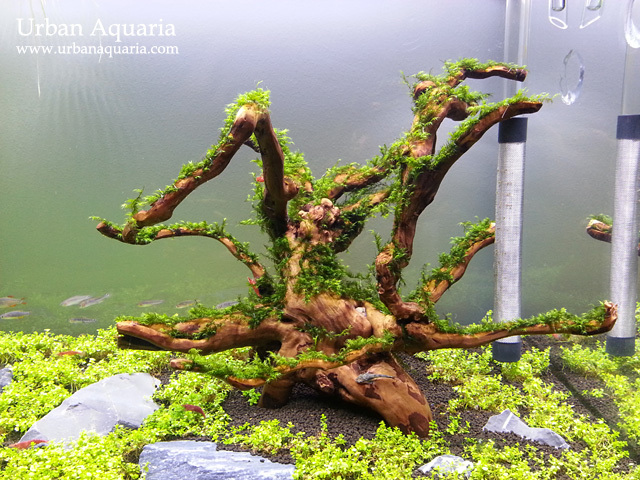 If you add more bio-load and parameters start to get unbalanced, then just have to do more water changes and more frequent tank/filter maintenance. Ahh yeah that's what i was afraid of. Think even female bettas might not be a good idea. It's ok then the endlers do a good enough job of being the 'feature' fishes, with their bright colours.